Beautiful Oriental Room Dividers for a Zen Home! I LOVE Oriental Screen Room Dividers! Are you looking for the most beautiful oriental room dividers being sold? I love Asian furniture and oriental decor! On this page, you are going to find my top favorite best oriental room dividers for sale! *The one in this picture is a stunning cranes and willow trees design on gold background Chinese decorative folding screen for sale! It is a true piece of art! The colors and details are absolutely amazing! Whether you call them Asian room dividers, Chinese room dividers or Japanese folding screens, you will find them all here! They are perfect for creating a ‘private’ space for you in any room or just to decorate and complement your ‘zen room’! 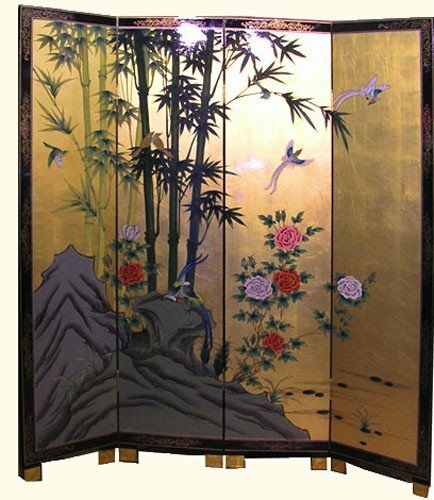 My favorites are the gold leaf Chinese room dividers and hand-painted nature scene ones! They also make excellent gift ideas for anyone in the family who enjoys Asian decor! I hope you’ll enjoy my selections and find the best oriental room divider for your home! 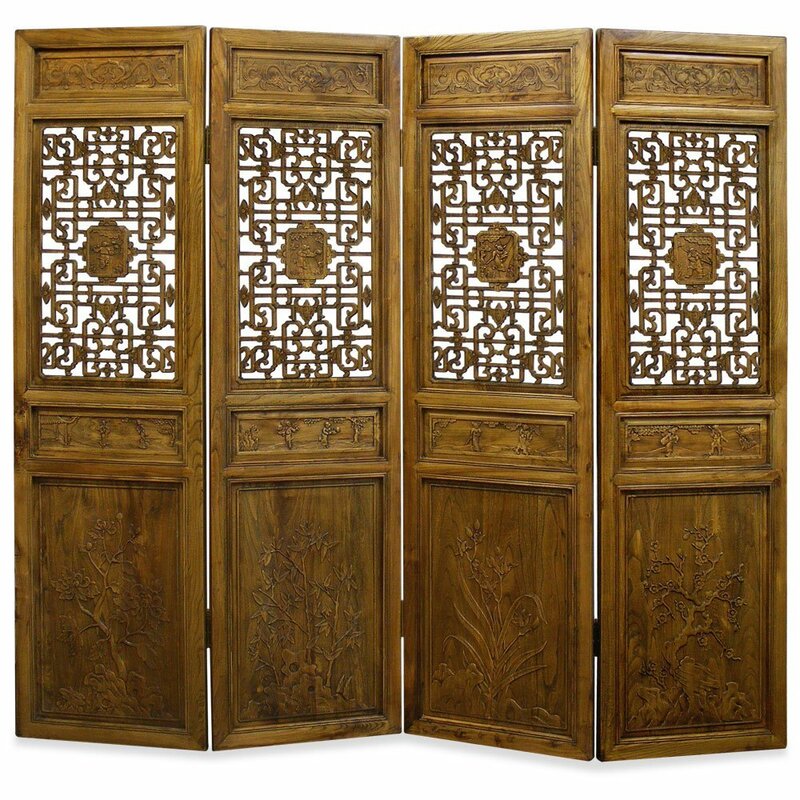 What a beautiful 4-panel lacquered wood Chinese room divider for sale! I love the Spring Festival on a courtyard scene design! They stand out against the black background! I also love the gold bamboo trees! A wonderful piece to have in your home! 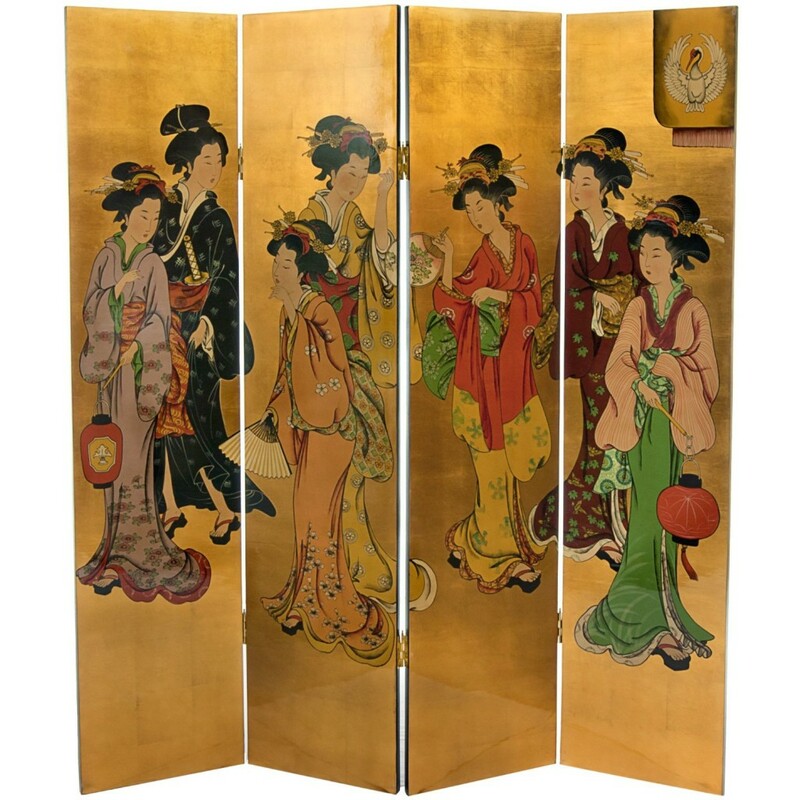 This is a traditional 6-panel Japanese privacy folding screen for sale. You can have it in four different colors and panels! Very elegant and very unique! It is also very strong, very sturdy and very well-made! Perfect to create a beautiful Asian bedroom or Asian inspired living-room! 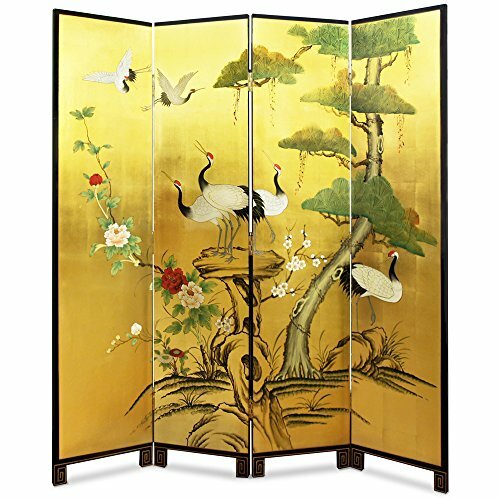 How beautiful is this gold leaf 4-panel Chinese bamboo and birds design room divider screen for sale folks? Will look amazing in your Asian inspired room! Best Asian Room Dividers for Sale! This is a gorgeous 6 feet tall Chinese double happiness symbol room divider screen for sale! If you are looking for really tall oriental room dividers you are going to be very pleased with this gorgeous red phoenix theme divider! It has 6 panels and a beautiful crackle finish! 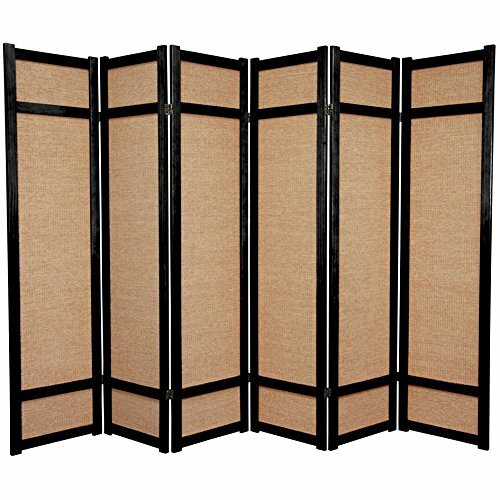 This is a very expensive HUGE elmwood 4-panel Chinese floor screen room divider for sale! I had to show you because it is absolutely breathtaking! This is typically used as a room divider in Chinese houses. The gorgeous open pattern design is meant to allow air to circulate through the screen. If you look closely you will see a different tree design on each wood panel at the bottom! 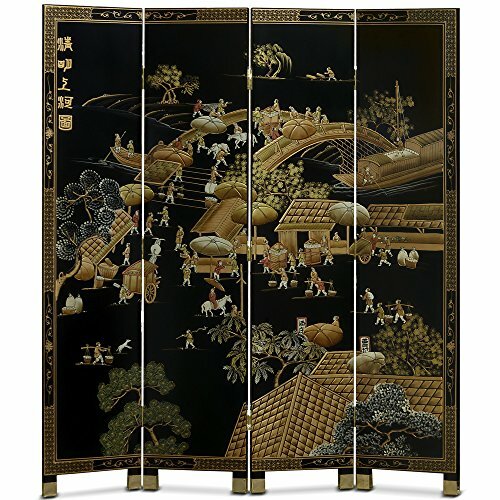 If you are looking for the largest and beautifully hand-painted Chinese room divider screens for sale I think you are going to LOVE this one! It has the scene of a Chinese spring festival! Perfect piece to help you create a wonderful ‘oriental style room’ in your home! Very Large Courtyard Scenery Design Chinese Floor Screen Room Divider! Amazing Asian Room Dividers for Sale! Another HUGE and amazing 6-panel hand-painted Chinese courtyard scene room divider screen for sale! The colors and details are very vivid! The back side has beautiful gold bamboo trees painted! This is a luxurious hand-crafted ancient Chinese longevity design floor screen room divider in a gorgeous and very rich cherry finish! The beautiful longevity symbols are carved on both sides! This piece will last for many generations to come! I love golden Chinese divider screens! 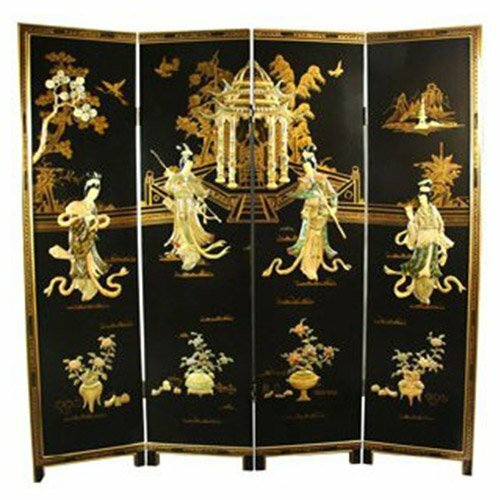 This is one of the most beautiful Chinese ladies design gold decorative room divider for sale! The panels are about 72 inches tall. This is one of the cutest gold leaf background Asian room divider for sale! Gorgeous piece to have in your oriental inspired living-room! 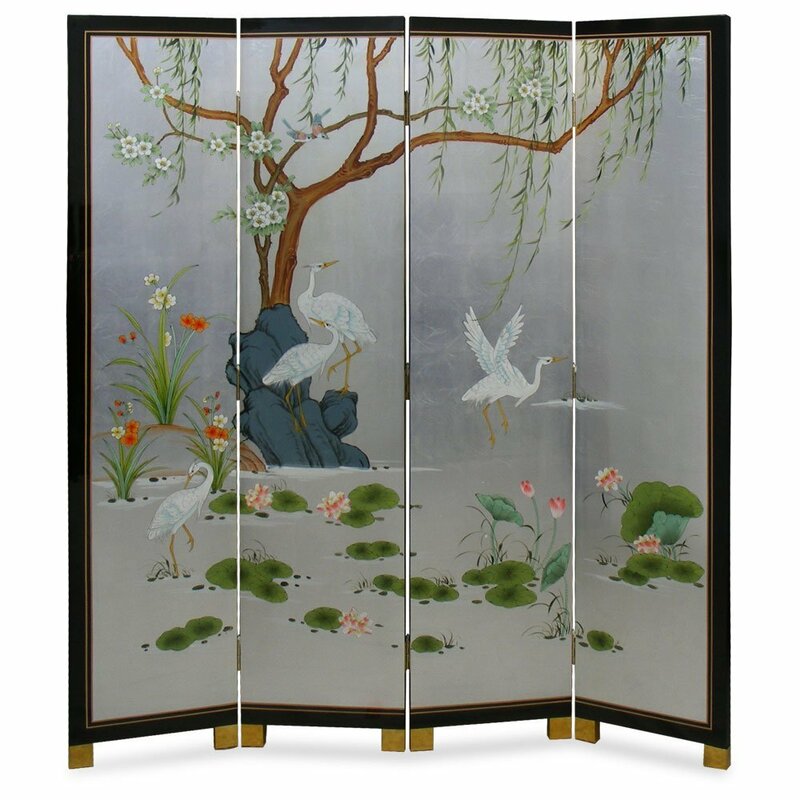 Cranes and Willow Silver Leaf Chinese Floor Screen Room Divider! Another huge favorite of mine is this stunning silver leaf background with cranes and a willow tree! The wood is very heavy and it looks absolutely stunning! The cranes and willow tree represent peace and longevity in Chinese culture. This is a gorgeous 4-panel authentic Ming style lady warrior motif Chinese decorative privacy screen for sale! The gold colors on the hard black lacquer are stunning! The screen is about 72 inches tall. Very elegant piece to complement your oriental room decor! Beautiful Chinese Cabinets for Sale! 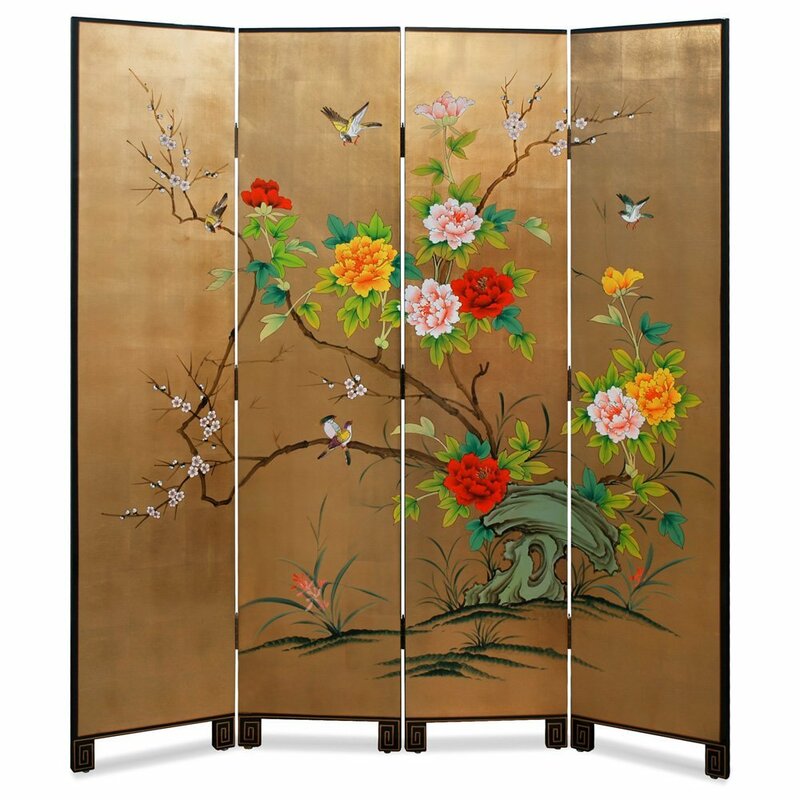 I’m looking for an 84″ three or four panel gold leaf screen with birds/ Peacocks or Ladies in Kimono.